Are Hedgehogs elegant? I’m not convinced. Cute for sure, riddled with fleas, undoubtedly and pretty handy for getting rid of slugs in your garden but would they be the first animal you’d think of as an archetype of ‘elegance’? I suspect not. 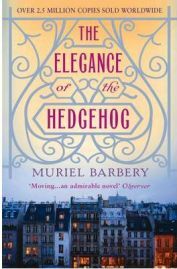 But if you’re as prone as I am to grabbing a book on the basis of a silly title, then you’ve probably already got The Elegance of the Hedgehog by Muriel Barbery on your bookshelf along with A History of Tractors in Ukrainian and The Particular Sadness of Lemon Cake. I’m a sucker for a provocative title. The Elegance of the Hedgehog is set in Paris, in an exclusive apartment block of lavish luxury homes inhabited by wealthy and largely self-satisfied folk. Keeping things ticking over in 7, rue de Grenelle is Renee, the widowed middle-aged concierge. She’s a frumpy little woman who aspires through her dress, behaviour and existence to achieve a state of near total invisibility. She has no desire to draw attention to herself or to anything she says or does and beneath her dowdy and unassuming exterior lurks a secret life – Renee is a closet intellectual. Despite leaving school at an early age and growing up dirt-poor she has taught herself about art, literature, music and cinema, cultivating a taste so exquisite that she’s terrified that if she shows her ‘true’ self she will lose her job and with it her secure and self indulgent little life. Her brain repeatedly over-rules her mouth, clutching back the words that she fears might give her away. Upstairs in one of the flats lives another closet intellectual – twelve year old Paloma. It’s probably no exaggeration to say that 12-year old girls are given to over-indulgence in self-examination and Paloma spends a lot of time hiding from her family, developing what she calls ‘Profound thoughts’ and despairing about the prospect of turning out like her air-head sister or her pretentious mother. She vows to kill herself on her 13th birthday and to probably set light to her family’s apartment just before her suicide. In the mean time she has six months or so to capture her profound thoughts in writing. These two lonely souls might have remained disconnected but for the unfortunate death of one of the apartment owners and the subsequent purchase of his property by a Japanese gentleman called Kakuro Ozo, a man for whom the Parisian snobbery of his neighbours is as alien to him as his oriental origins are to them. As an outsider in their midst, Ozo can work away at the barriers that both Renee and Paloma have put in place. He spots in Renee a fellow lover of Tolstoy, a lady of refinement that others around her cannot see and which she herself hides. Can he break down the walls that Renee has built around herself? Can he persuade her to value who she is and what she knows? And can he give Renee and Paloma a companionship that both need and to which neither admits? This book is a very odd mix of styles and sometimes quite disparate elements. Barbery is by training a philosophy teacher and at times I felt very resistant to being ‘taught’ and I skipped the passages where Renee indulges in her tendency to ‘go off on one’ about something arty or philosophical. The book is delivered in different voices – alternating the story told by Renee and that told by Paloma. Paloma splits her contributions between her ‘profound thoughts’ which seem unintentionally quite amusing and her observational pieces about life in her family. Renee delivers philosophical passages and ‘story’ chapters in which things actually happen. If I wanted to read philosophy I wouldn’t go looking for it in a novel so I skipped a lot of the more rambling passages, eager to get to the story. I enjoyed the slow gentle ‘flowering’ of Renee like one of the camellias she tends in the garden. I liked seeing the butterfly preparing to shake out of the chrysalis. I can’t honestly say I found the transformation very believable, but I was prepared to suspend my disbelief. I enjoyed the snobby apartment dwellers and their prejudices, tried hard not to look too closely at the prejudices of Renee and Paloma, and willed myself to just go along with the story. I loved the moment when Renee realises that Simone Pallieres, one of the posh ladies upstairs, has destroyed a sentence by the misuse of a comma in the sentence “Would you be so kind as, to sign for the packages”. The ending when it arrives is a shocker – I can say no more than that. I was in the bath when I got to the end and I nearly dropped the book, I was so surprised. I certainly hadn’t seen it coming or predicted its consequence. But I finished the final pages and put the book down with a lump in my throat, wondering if anyone could make a decent film out of the lovely little story that has to fight its way out through all the pretentious long words and airs and graces. Would it be possible to capture this story without the written word on the page? I’m not sure, but based on my ability to ignore the ‘boring bits’ and get on with the story, I suspect it would be. No Comments on "The Elegance of the Hedgehog"